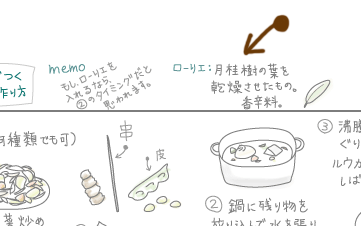 All doodles of background in this webpage are written by Mio. These are comments about background doodles of sample diagrams. Background doodles of sample diagrams are led to something of each works. But several doodles may be hard to imagine what it is led to and we comment for it. The background of Fragrant Bloom is drawing about the Koudou (Kōdō). The koudou mearns Japanese cult of incense burning. This is cooking menu of curry mio created. The bay leaf of materials is related to Daphne Odora.